As I get older and more curmudgeonly (Mrs. SF’s view is that it is no longer possible for me to get more curmudgeonly having hit 100% on the scale some years ago), I don’t like/seriously dislike a fuss on my birthday. I usually try to be somewhere abroad but this year the dates for the Glastonbury Festival conspired to stymie that plan (my Mum, yes my Mum the lunatic, always goes – so no one to look after the dogs). In the absence of a holiday (we went the week before instead) I thought a nice meal would help a bit to assuage my misery at getting yet another year older. 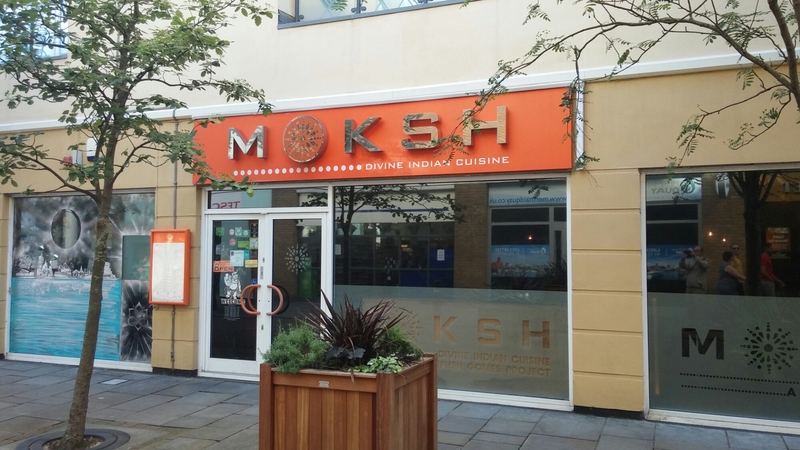 One of a number of upscale Indian restaurants in Cardiff, it differentiates itself from the competition with the chef/patron Stephen Gomes championing a truly experimental approach to one of the World’s classic cuisines. Some may say the classics should not be messed with and I certainly take the view, on many things, that “if it ain’t broke don’t fix it”. The craze (hopefully waning) for deconstructed dishes can in the wrong hands be just bloody laziness in my view and have noted with horror that this has reached the extremes of a deconstructed coffee!!!!!!! I mean really. Innovation that serves no purpose other than to be too clever by half is in my view a waste of time and money, but if it adds something different like a new texture or flavour combination that works then I am all for it. Whilst there is a bit too much (any) deconstruction on Moksh’s menu for my liking, it came highly recommended from multiple sources (even by my ultra fussy friend Fraser and if Moskh can persuade him to try and like something a bit different I surmised that they must be close to miracle workers). Inside it is smaller than I expected, but was nice enough if a bit cramped (tables are quite close together – but I don’t mind that as means I can have a nose at what others are having). 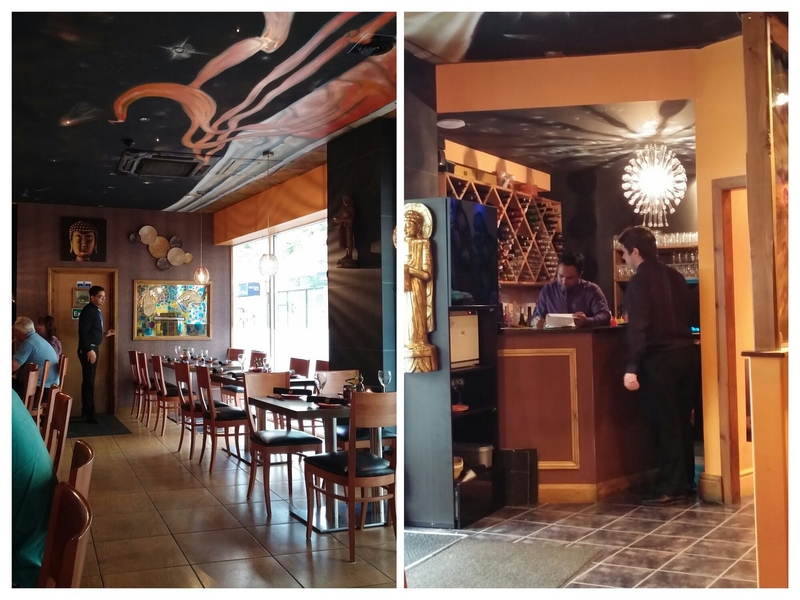 Bit like most of the more upscale curry houses in Cardiff if am honest. The menu is split between al a carte and a standard (£40)and veggie (£33) tasting menu. I am a sucker for a tasting menu as I like to see the full gamut of what a chef can do, with a tasting menu allowing them to show off a bit. The risk, of course, is it can be a bit hit and miss. and we decided that that was going to be the order of the day. 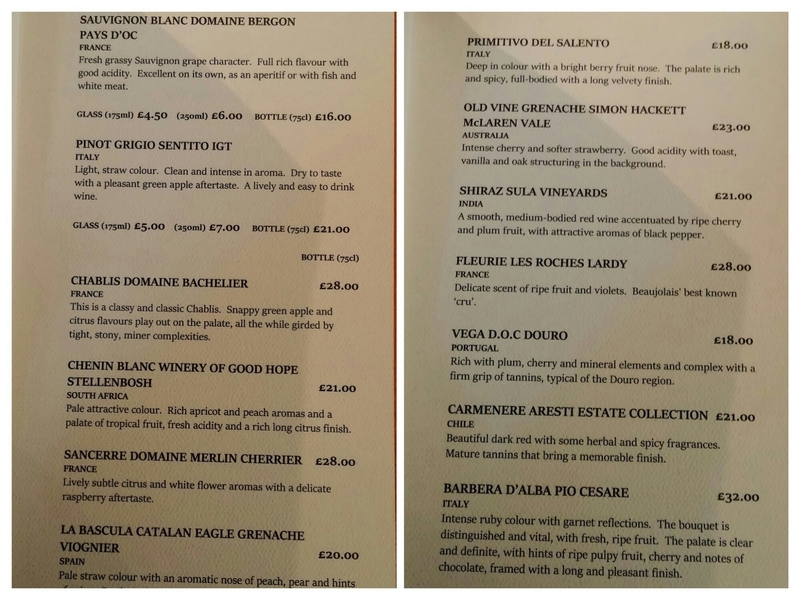 Having looked at the wine list nothing took my fancy (no gruners or rieslings) in terms of coping with the diverse flavours of a tasting menu, bar from maybe the NZ pinot gris or the SA chenin blanc on it. so we decided to give the wine pairing with the tasting menu (£20 a head on top of base price of £40) a whirl (despite doubts as to a couple of the wines pairings). Normally an amuse bouche is a soupçon of something to wet the appetite in terms of what is to follow. Moksh (ever seemingly striving to be different) has jettisoned that principle by having no less than four (not insubstantial) amuse bouches to start off proceedings. 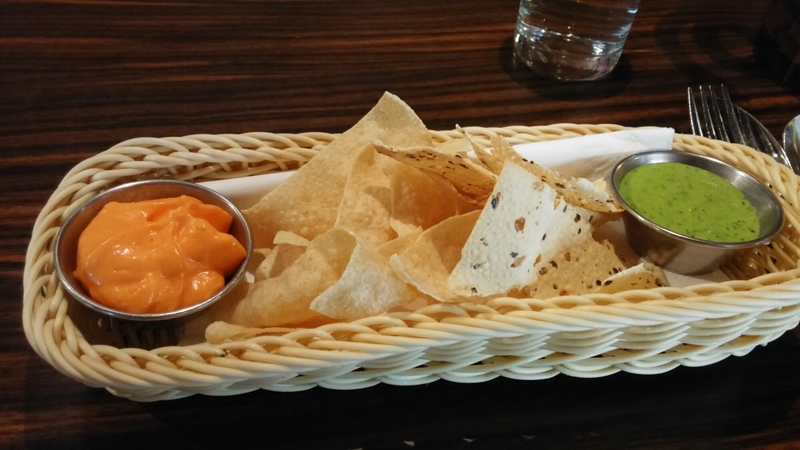 First up was a rather superior basket of papadums shards and dips. Star of the show was a lovely, light, mousse like mango “air”. A rather nice take on your standard curry house mango chutney. 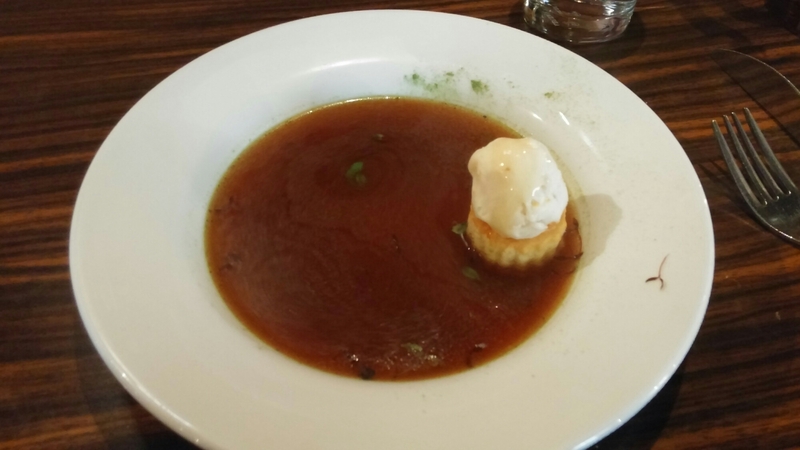 a spicy chicken soup with ginger and pepper spice, as well as a ginger and honey ice cream atop a vol au vent. Nice contrast between the hot spicy soup and cold, sweet, ice cream. Very big portion for an amuse bouche – I was expecting an espresso cup size. The third amuse was a “Mas – ala -croon”, a macaroon lightly flavoured with masala spice. Presented in a pretty faux jewel encrusted box and more amuse bouche size, it was very nice (no photo due to a camera/operator malfunction) . The fourth (yes, the fourth ) amuse was a very odd affair called “An Alchemist’s Love of Onion Bhaji” and the only real dud of the night, with a dreaded deconstruction. Now to me if you deconstruct something it has to be better than the original. Here it was (to my mind) inferior to a good onion bhaji with the deconstructed onion sponge being a bit boring. It was a tad dry and lacking in oomph flavour wise (surprisingly so, as other dishes were packed full of flavour) To add insult to injury it came on what looked like a medium-sized “Home Bargains” non stick frying pan complete with plastic handle. “Why?”, was my first thought when it arrived, followed by “How on earth is this better than a plate?”. Mrs. SF had to bite her lip to stop herself laughing. 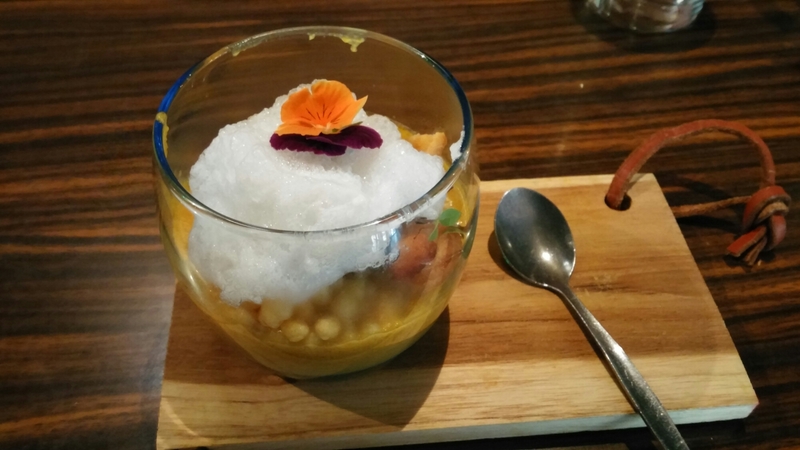 The only redeeming element was the tangy tamarind sorbet that sat on top of the onion sponge. without the full horror of the frying pan. Three out of four is not bad, but I think (bearing in mind what was to come) four amuse bouche was probably two/three too many. Wine pairing – the wine with this set of dishes was an Indian sauvignon blanc from Sula Vineyards. A typical sauvignon blanc that worked well enough with the amuse bouches (it was perhaps a bit overpowered by the spice in the chicken soup though). We moved on to the first of the starters in the form of “Atlantis“, a pimped up version of a classic Goan prawn xec xec curry. This had plentiful, nicely cooked, juicy prawns and a lightly spiced coconut based sauce. A pretty dish this, with flavours to back up the look. Again it was a big portion for a tasting menu. 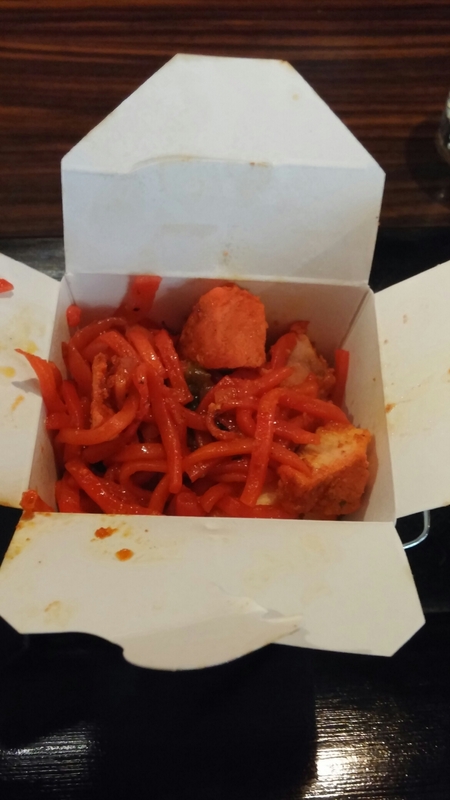 The second starter was “Tangra”, a playful take on hakka chicken noodles – coming in one of those US style takeaway cartons. Nice flavours here with well (not over) cooked noodles and nicely spiced chunks of chicken. I loved the mango noodles in it, which added a welcome touch of sweetness, as well as the overall Indo-Chinese hybrid nature of dish. Really enjoyed this. Another big portion size. 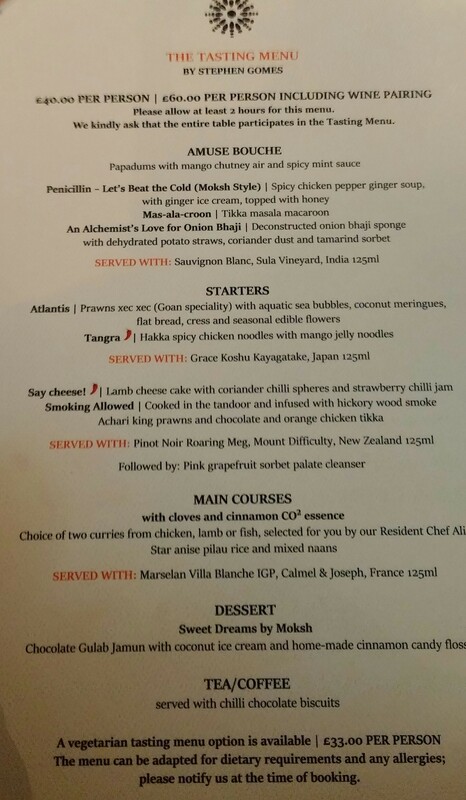 Wine pairing – The wine with these dishes was a very interesting Grace Koshu number from Japan. Kudos to Moksh for putting such a wine on their list, which was like a delicate pinot grigio. It worked well with the prawn dish but was a bit too delicate perhaps to cope with the more robust spicing in the Tangra). Another set of two starters and I was starting to feel a bit daunted as to the amount of food yet to come. “Say cheese” was a coarse lamb and cheese pâté on a base, with a good flavour to it. 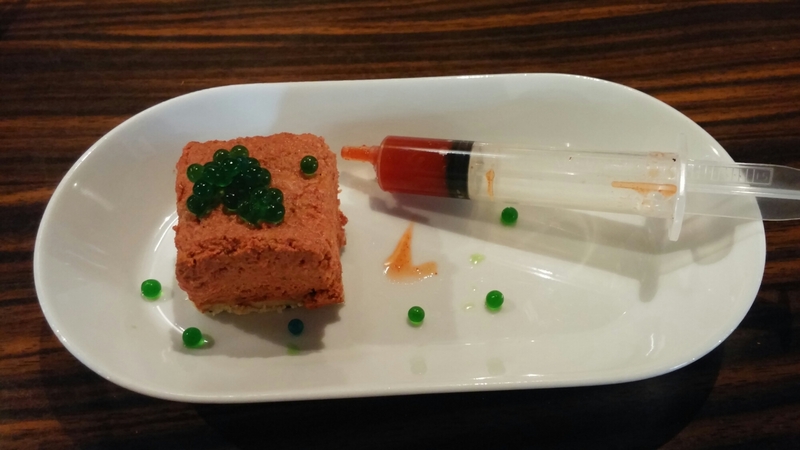 It was nicely complimented by coriander chilli spheres, but I was not convinced by the strawberry chilli jam especially with it coming in a cheap plastic syringe. Mr. SF and I thought it looked a bit naff. The next starter,”Smoking allowed“, was a triumph. 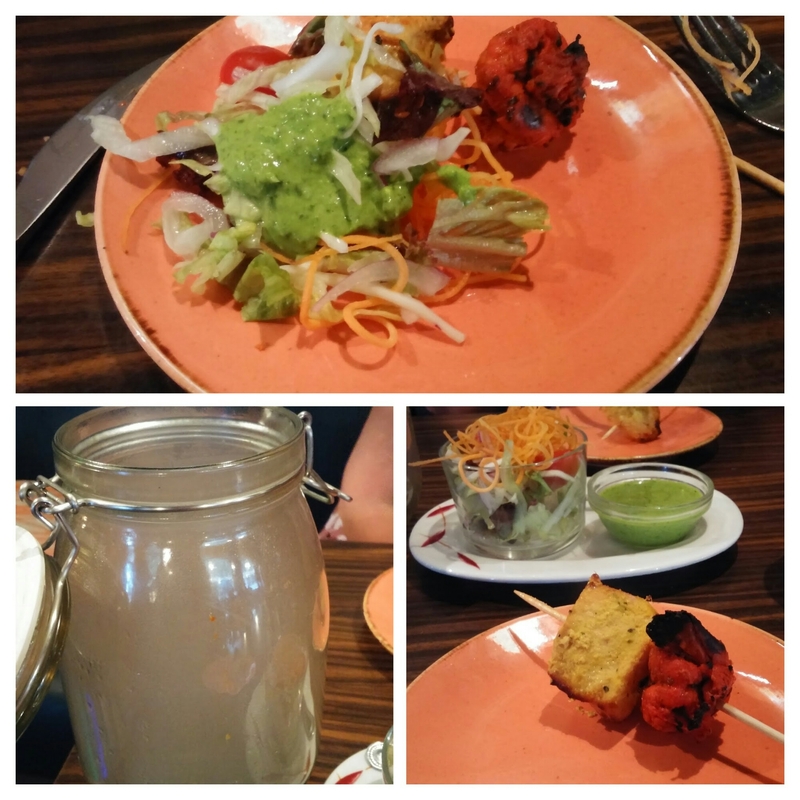 Infused with hickory smoke, the chunky tandoor cooked prawn was full of flavour and the chocolate orange chicken was a revelation. Subtle and really clever flavours here. Sounds odd but trust me it really worked beautifully. Best dish of the night this and I would have happily concluded the savoury proceedings at this point. Wine pairing – A nice New Zealand Pinot Noir, in the form of a Mount Difficulty Roaring Meg, was the pairing here and it worked very well with both these dishes. Sweet cherry with a touch of oak and vanilla spice was perfect with the chocolate orange chicken and had enough ummph to cope with the hickory smoke. 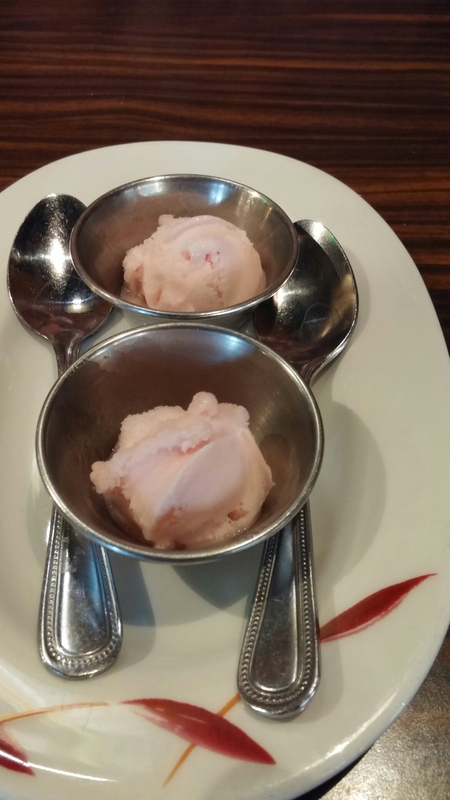 A zesty grapefruit sorbet helped to refresh our somewhat overworked palates at this point. 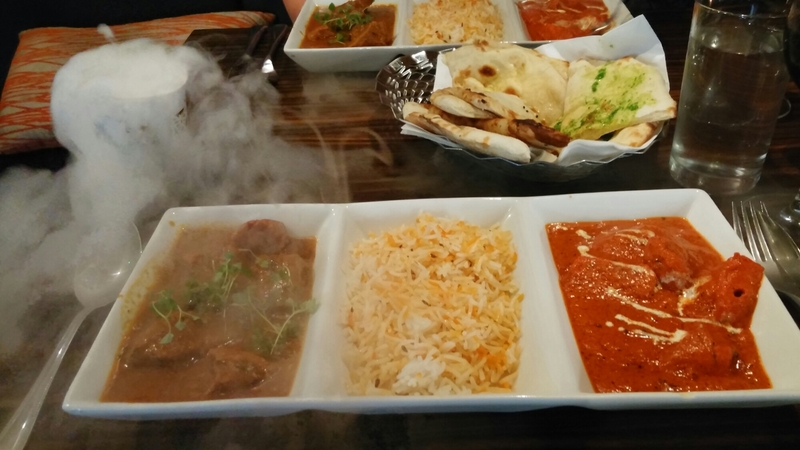 numerous naans (very nice from the small taste I had) and star anise flavoured rice (again very nice and perfectly cooked) tipped both Mrs. SF and I over the edge from contentedly sated to very full up. The clove and cinnamon essence (dry ice) did provide a very pleasant aroma – would happily have that smell wafting around my house. At this point I was pretty much ready to throw in the towel as I was really quite full. was somewhat wasted on me, as I was stuffed to the gunnels. I passed on coffee and a chilli chocolate biscuit (despite it being part of the deal) as I feared if one more morsel of food or sip of drink passed my lips I would have done a Mr. Creosote and exploded. Only one duff dish (“An Alchemist’s love of Onion Bhaji”) on a long tasting menu and a couple of really good dishes (the “Smoking allowed” and the “Tangra“) is pretty good going. 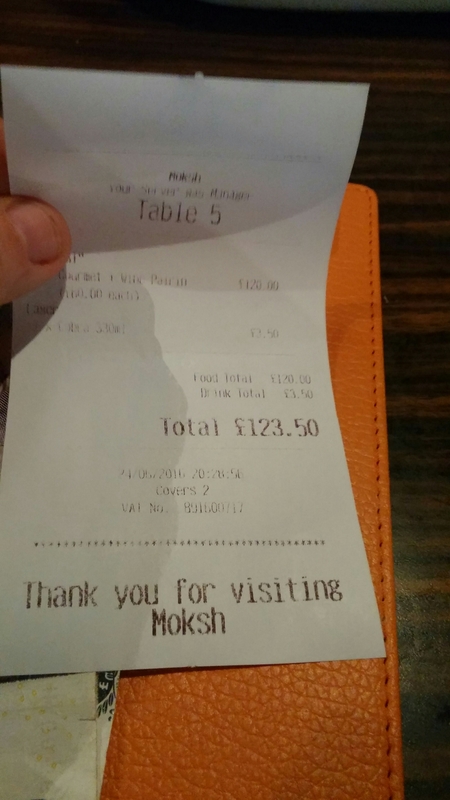 My only real gripe, which may seem odd, is the sheer amount of food that Moksh’s tasting menu provides. It was (if you count the papadums, but not the sorbet or coffee and biscuits) 10 course and some of these were just too big (at least for me) for such a long menu. By the end I was uncomfortably full and as a result probably did not appreciate the main course curries and naans or the pudding as much as they deserved. Size wise I wouldn’t have been unhappy if the portion size of the main course curry dish had been halved or the number of courses paired back a bit or at least some made a bit smaller. I would also suggest taking that Marselan off as the wine pair with the curries and ditching the frying pan and the syringe. Service was very good with the meal nicely paced and all the dishes and wine pairings explained. Well deserving of the tip we gave. I thought, for what we got, this was very good value. Would I go back ? Oh yes, loved the “Smoking allowed” and would go back on the strengh of that alone. Not sure if I would order the tasting menu again as it was just too much, but it certainly was an experience and I am glad I tried it. Certainly can’t fault it for value for money that is for sure. If you go for the tasting menu my advice is skip both breakfast and lunch that day. Al a carte for us next visit, I think. 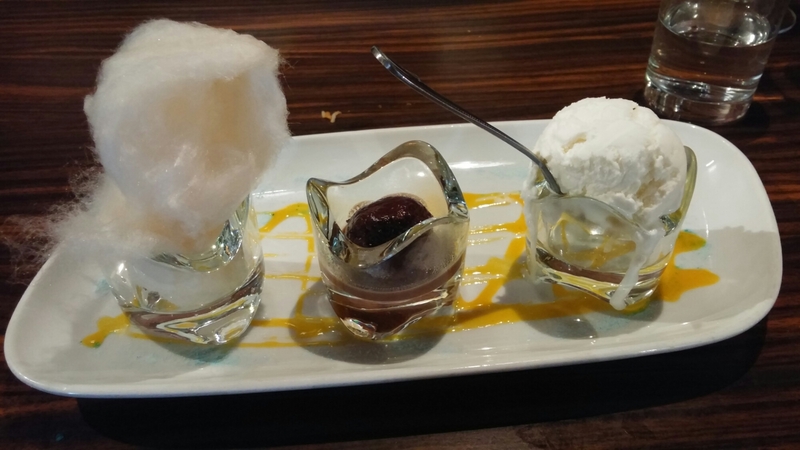 This entry was posted on Jul 10, 2016 by solicitingflavours in Alcoholic drink, Alternatives to sauvignon blanc, Cardiff restaurant, Curry, desserts, Drink, Dry white wine, Fine dining, Food, Food and wine products, French wine, German wine, Gruner Veltliner, Indian, Indian wine, Japanese wine, Moksh, New Zealand wine, Pinot Noir, Red Wine, Restaurant Review, review, Riesling, Tasting menu, White wine, wine, wine pairing.